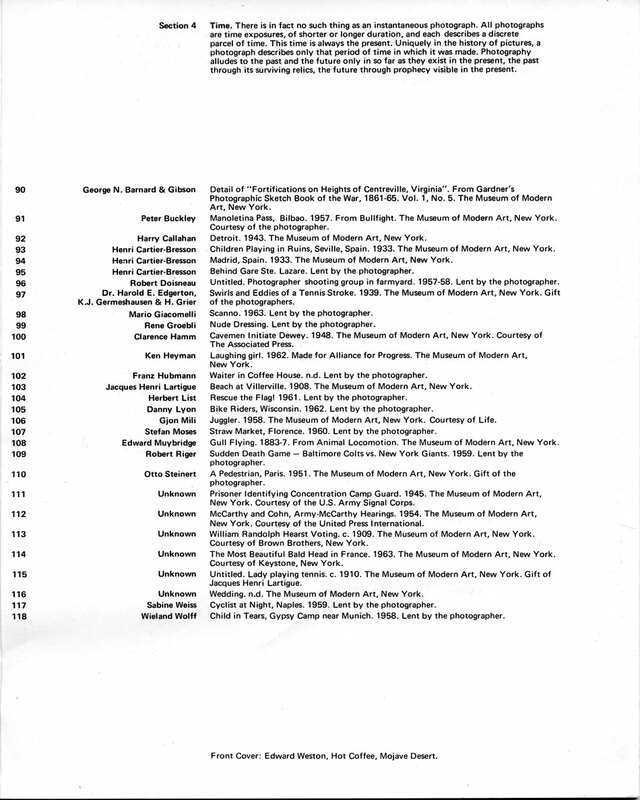 The first photography exhibition at the National Gallery of Victoria (NGA) was The Photographers Eye from the Museum of Modern Art in New York. 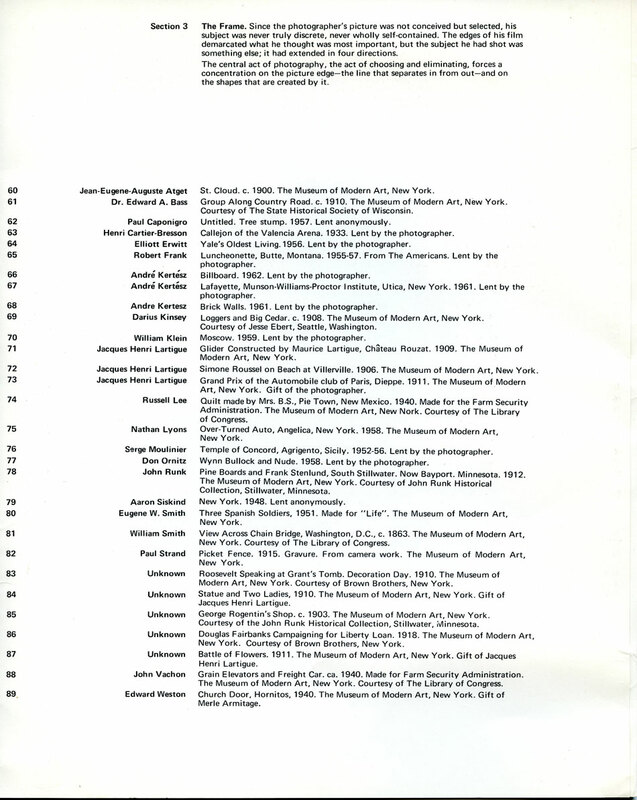 This was facilitated through Albert Brown’s connections with Museum of Modern Art's photography curator, John Szarkowski. The pamphlet for the exhibition has been uploaded below - the original was supplied to photo-web by Albert Brown in 2017. 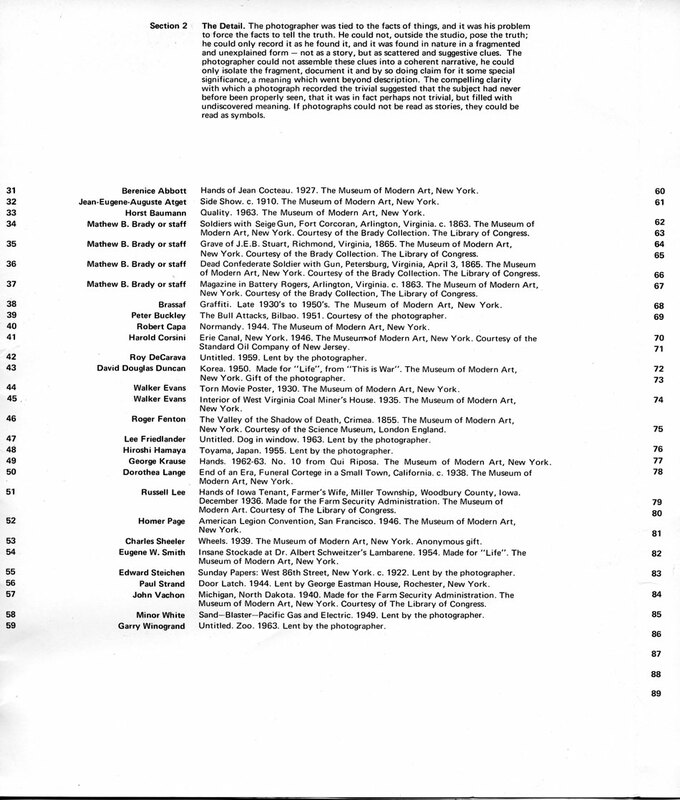 The pamphlet's text (the curatorial statements - not the listings) has been scanned separately and has been provided at the bottom of this page. 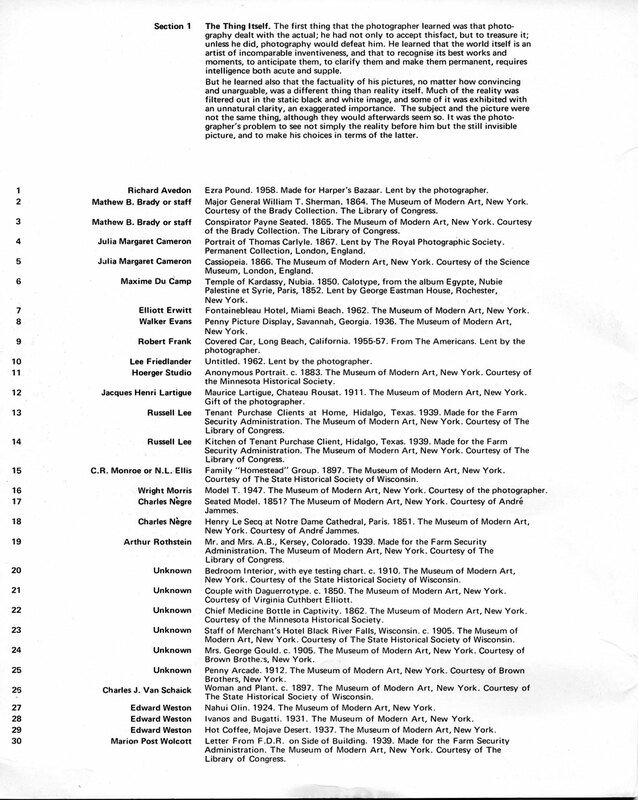 An exhibition circulated by The Museum of Modern Art, New York under the auspices of The International Council of The Museum. This exhibition is an investigation of what photographs look like, and why they look that way. It is concerned with photographic style and with photo­graphic tradition: with the sense of possibilities that a photographer today takes to his work. The pictures exhibited here were made over almost a century and a quarter. They were made for various reasons, by men of different concerns and varying talent. They have in fact little in common except their success, and a shared vocabulary; these pictures are unmistakably photographs. The vision they share belongs to no school or aesthetic theory, but to photography itself. The Thing Itself. The first thing that the photographer learned was that photo­graphy dealt with the actual; he had not only to accept thisfact, but to treasure it; unless he did, photography would defeat him. He learned that the world itself is an artist of incomparable inventiveness, and that to recognise its best works and moments, to anticipate them, to clarify them and make them permanent, requires intelligence both acute and supple. But he learned also that the factuality of his pictures, no matter how convincing and unarguable, was a different thing than reality itself. 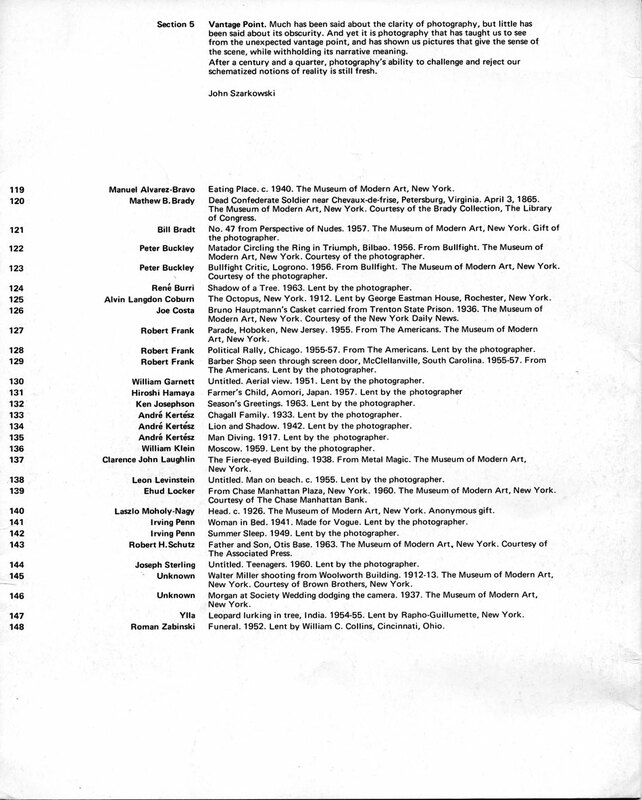 Much of the reality was filtered out in the static black and white image, and some of it was exhibited with an unnatural clarity, an exaggerated importance. The subject and the picture were not the same thing, although they would afterwards seem so. It was the photo­grapher's problem to see not simply the reality before him but the still invisible picture, and to make his choices in terms of the latter. The Detail. The photographer was tied to the facts of things, and it was his problem to force the facts to tell the truth. He could not, outside the studio, pose the truth; he could only record it as he found it, and it was found in nature in a fragmented and unexplained form — not as a story, but as scattered and suggestive clues. The photographer could not assemble these clues into a coherent narrative, he could only isolate the fragment, document it and by so doing claim for it some special significance, a meaning which went beyond description. The compelling clarity with which a photograph recorded the trivial suggested that the subject had never before been properly seen, that it was in fact perhaps not trivial, but filled with undiscovered meaning. If photographs could not be read as stories, they could be read as symbols. The Frame. Since the photographer's picture was not conceived but selected, his subject was never truly discrete, never wholly self-contained. The edges of his film demarcated what he thought was most important, but the subject he had shot was something else; it had extended in four directions. The central act of photography, the act of choosing and eliminating, forces a concentration on the picture edge—the line that separates in from out—and on the shapes that are created by it. Time. There is in fact no such thing as an instantaneous photograph. All photographs are time exposures, of shorter or longer duration, and each describes a discrete parcel of time. This time is always the present. Uniquely in the history of pictures, a photograph describes only that period of time in which it was made. Photography alludes to the past and the future only in so far as they exist in the present, the past through its surviving relics, the future through prophecy visible in the present. Vantage Point. Much has been said about the clarity of photography, but little has been said about its obscurity. And yet it is photography that has taught us to see from the unexpected vantage point, and has shown us pictures that give the sense of the scene, while withholding its narrative meaning. After a century and a quarter, photography's ability to challenge and reject our schematized notions of reality is still fresh. 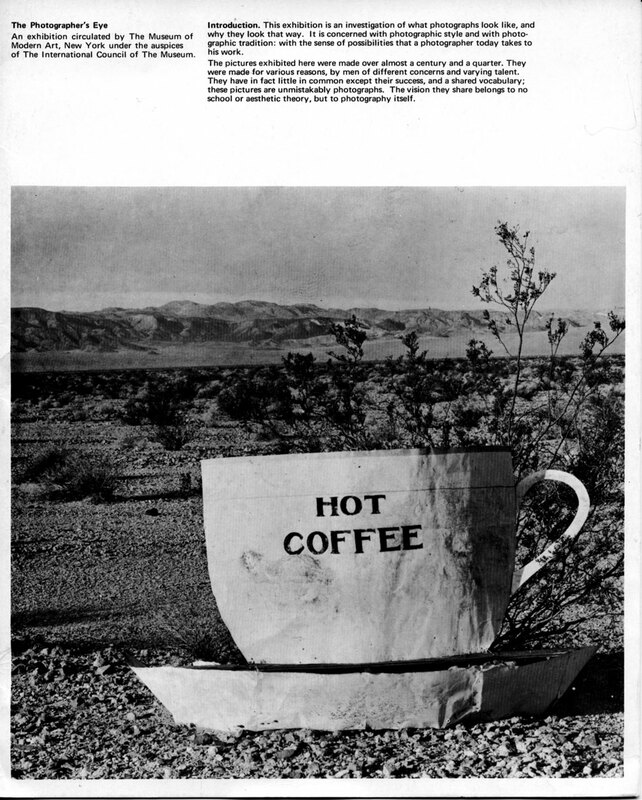 Front Cover: Edward Weston, Hot Coffee, Mojave Desert.